Have I embarrassed myself? Will I die on this hill? In case anyone’s seen the latest interview with Daniel Portman aka Podrick Payne, and wondering how I feel about his answers: I’ve seen it. I have ideas. I’m withholding those ideas in the interest of not embarrassing myself. 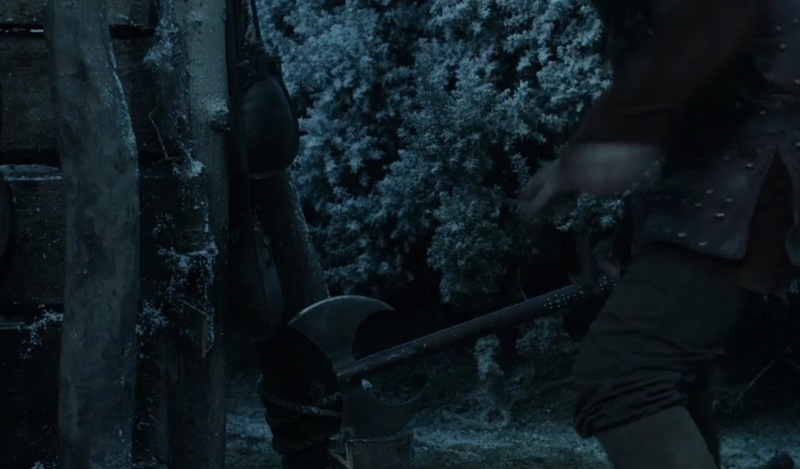 In case anyone hasn’t seen the interview and wondering what I’m talking about: he hasn’t told us anything about where Podrick went with that axe. He hasn’t answered any other of my questions, either, but those questions aren’t really his responsibility, so that’s fine. We still don’t know what Podrick was doing in the finale. Also, if you haven’t ordered it already, you should totally get the Season 5 DVD set, and you should absolutely listen to the audio commentary track of Episode 2, with Gwen, Nik and Daniel Portman. They’re so, so funny together. I was worried it would be mostly just Nik and Gwen having fun together and Dan not getting a chance to say anything, but really it’s just the opposite. It’s mostly Gwen and Dan having fun together and trying to keep Nik in the action, but he keeps getting left behind. They don’t give us anything we don’t already know, but even so, they’re hilarious. I’m gonna put this pic of Sam and Gilly here because I can’t fit it anywhere else. We see Sam, and Gilly, in what looks like the hold of a ship. We don’t see Baby Sam. Sam looks like he’s about to blow chunks. Gilly looks unamused. That, or he’s talking to someone who’s just out of view. Gilly still looks unamused. Below I have pics of Sansa and Theon. See, I told you they survived the jump. I am so willing to die on this hill. This morning on the Metro, I was running some further analysis on Brienne & Podrick, as I am given to do, and this time the question was: plot significance. What were all the things they’ve done since saying goodbye to King’s Landing, and how did those events contribute to the plot? It’s not like I haven’t already obsessed multiple thousands of words of speculation on our big swordswench and her loyal squire, but this particular exercise was actually enlightening. Game of Speculation: O HAI! I said something in an earlier post about how such-and-such actor hadn’t been mentioned at so-and-so set, and that had me worried for the fate of his character. Game of Speculation: Have I embarrassed myself yet? How about now? Watchers brings us a fresh round of SPOILERS, or at least some VERY heavy speculation fodder, from Los Siete Reinos. My day = MADE. Are you muthafuckas ready for this?